Roast chicken with potatoes ranks pretty high on my list of things I like to cook, as I bet it does with most home cooks. It’s simple, it’s easy, and yields heart-warmingly delicious results, every time. Who wouldn’t love that? This time around I took a very minimalist approach with the chicken, just rubbing the skin with salt and pepper and stuffing a few rosemary sprigs and sage leaves in the cavity. I roasted it in my (beloved) cast-iron pan over new potatoes and wedges of onion and made a quick apple cider pan gravy to serve alongside. The result? Total comfort food bliss and a beautiful dinner that tasted like I went to a lot more trouble than I actually did. First we’ll pat the chicken with paper towels until it is very dry. This is crucial for crispy skin. Rub it with plenty of salt and pepper and stuff the cavity with herbs and a couple of smashed garlic cloves. Do this first and let the chicken sit while you scrub potatoes and cut the onions; the salt will continue to dry out the skin leading to crisper (and yummier) results. I used a mix of yellow, red, and purple-skinned new potatoes to roast under my chicken. 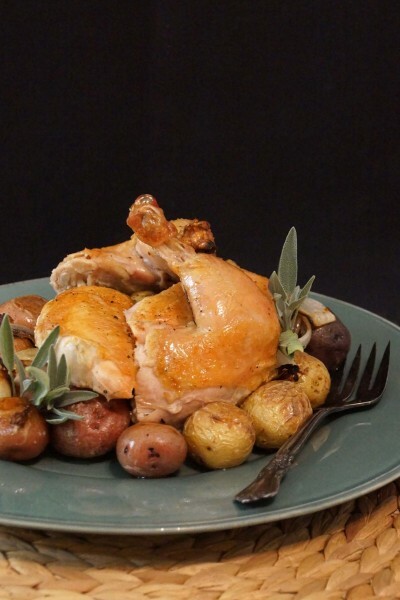 You’ll want potatoes that are about an inch in diameter to match the roasting time of the chicken. If you’re working with larger potatoes, don’t sweat it; just cut them in half or in wedges. Toss them in a big skillet or roasting pan with onion wedges and a drizzle of oil and a sprinkle of salt. Set the bird on top of the potatoes and it’s ready to go in the oven. I swear the ease of making roast chicken isn’t the only reason it’s one of my favorite dinners. 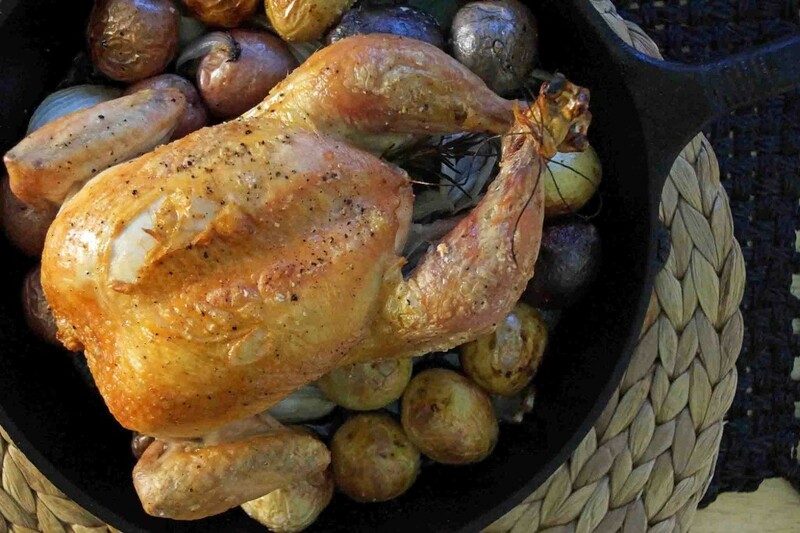 Roast until the chicken is beautifully golden with crackly skin and the potatoes are tender and smashable. Transfer the potatoes and onions to a platter, the chicken to a cutting board while you make a quick pan sauce to tie it all together. Add apple cider, a splash of vinegar, and sage leaves to the pan drippings and boil until the liquid reduces by half. Whisk in a spoonful of Dijon mustard, followed by a pat of butter. Taste and season…yikes, that’s good! Carve the chicken and arrange the pieces over the potatoes. Pour the pan sauce into a bowl or gravy boat to serve alongside. Sit down, relax. Devour. I served the chicken and potatoes with a side of sautéed red cabbage for a simple, satisfying fall dinner. Pat the inside and outside of the chicken with paper towels until it's as dry as you think possible. Liberally season the skin and the cavity of the bird. Stuff the cavity with the sage, rosemary, and garlic, and tie the legs together with kitchen twine. Place the potatoes and onions in a large cast-iron pan, oven-proof skillet, or roasting pan and drizzle very lightly with olive oil. Toss and season with kosher salt. Set the prepared chicken over the potatoes and roast until the juices from the chicken thigh run clear when pricked with a knife and the potatoes are tender, 55 minutes-1 hour. 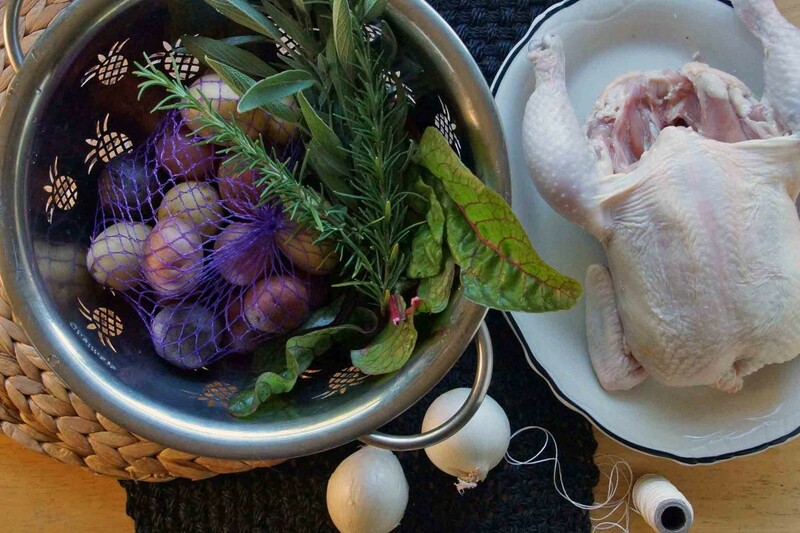 Transfer chicken to a carving board and tent with foil. Transfer the potatoes and onions onto a serving platter and place in the warm oven while you make the sauce. If there is more than a thin coating of drippings in the skillet or roasting pan, drain the excess. Place the skillet or roasting pan over high heat and add the cider, vinegar, and sage leaves. Bring to a boil and cook until half of the liquid has boiled off, about 5 minutes. Be sure to scrape up any brown bits that might be stuck to the bottom of the pan. 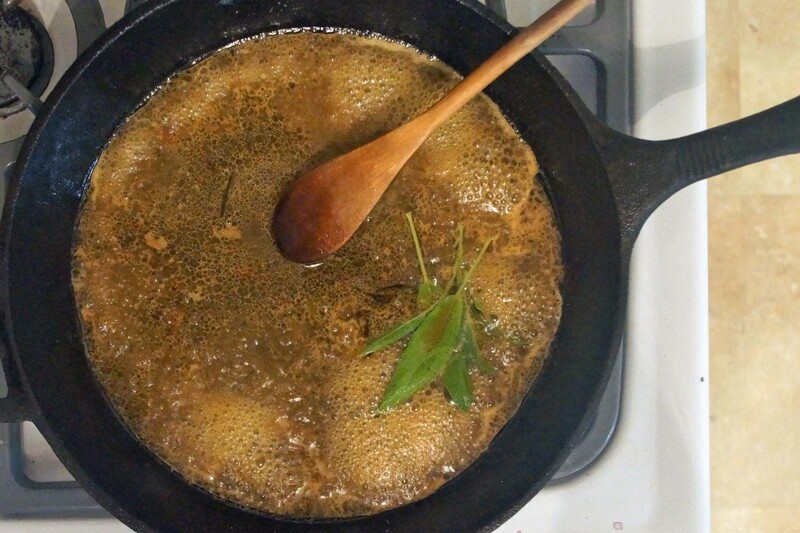 Stir in the mustard, then remove from heat, remove the sage leaves and stir in the butter. Taste and season as necessary with salt and freshly ground black pepper. Transfer to a small bowl or gravy boat. After you've made the sauce, the chicken should be well-rested and ready to be carved. Carve and arrange the chicken pieces over the potatoes and onions and pass the apple cider sauce alongside. 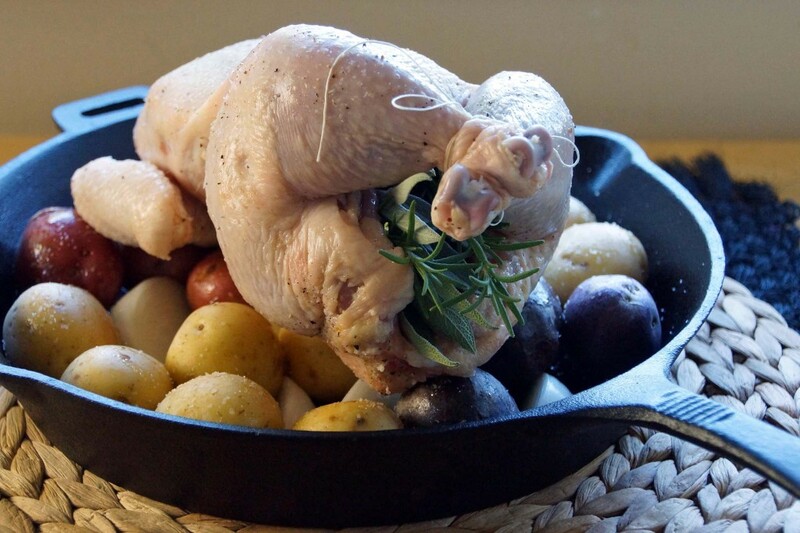 I’ve never used a cast iron pan to roast a chicken before! 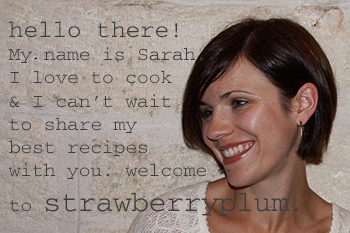 Great idea and great recipe, thanks! Mine is just the right size! any recipe with the words “apple cider” in it at this time of year is a total winner in my books. looks delicious! Made this chicken last night and it was delicious! Loved the apple cider addition…never would have thought of that! Thanks for including the printed recipes. It makes it so handy. Good, glad you liked it!